The connecting link between the pump and the irrigation system is the mainline. Mainline material is normally steel, aluminium with couplers, cement asbestos or plastic. Sizes can range from 5″ to 48″ plus. Generally with center Pivot, a water source at the pivot is most convenient. When water is unavailable at the pivot, a mainline pipe is often used to connect the pivot to the water supply. To avoid interference with farm operations and drive unit crossing, the mainline is generally buried. The proper size of mainline is a decision of economics. Whenever the yearly cost of owning a larger pipe size is greater than the yearly pumping cost for pumping through the next smaller pipe size; then one should use the smaller size pipe. A good rule of thumb would be not to exceed a velocity of water in the pipe of 5 feet per second. Pipe thickness or class should be selected to handle the highest pressures likely to be encountered. Friction factors of pipe are determined by experiments. Every type of material pipe is made from (steel, PVC, etc.) has different friction loss characteristics. Check valves. Used on discharge side of pump so if pump is stopped, it will maintain the water in the mainline not allowing water to flow back into the pump. Mandatory in all installations. Pressure relief valves. Relieves excessive pressure surges. They are usually spring loaded and set to open 5-10 psi above the operating pressure. Vacuum / air relief valves. Installed to prevent collapse of mainline when mainline is draining, especially where there are changes in elevation. Globe or butterfly or gate valve. Manually operated valves used to control the flow of water in the mainline. Also to be used when filling the system to prevent surges which could do damage to the system or the underground pipeline. Couplers. Devices used to join pipe joints from the pump outlet to the pivot inlet. May be steel to steel, PVC to steel, cement asbestos to steel, etc. Elbows / Tees. Used to alter the direction of flow such as from the pump outlet to the underground pipe from the underground pipe to the pivot inlet into the pivot and on to the system mainline. Flow or pressure regulators. Valves used to regulate the flow or pressure of water to the sprinkler system. These valves may incorporate a check valve. Normally these are solenoid operated and are automatically regulated and controlled. Fittings and valves as with the mainline will have friction losses. 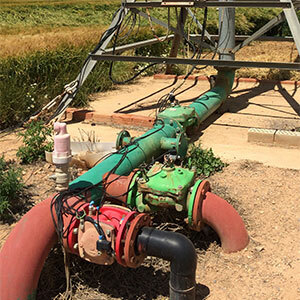 These losses must be considered in determining the total pressure drop or total dynamic head of the irrigation installation. Type of fitting or valve. Determination of these losses can be figured by converting the loss through fitting/coupler to equivalent lengths of pipe of same diameter.